If you spend a dollar in Olympia, it will only go so far. In a study of how far money travels, Cascadia is one of the most well defined regions of the country. So, if we network with only people within our region and our money only goes so far, what makes us different? If you're half politically (or otherwise) engaged and you're half paying attention in these parts, you're probably heard about Cascadia. On its fringe, the idea is of a regional breakaway from the United States and Canada. 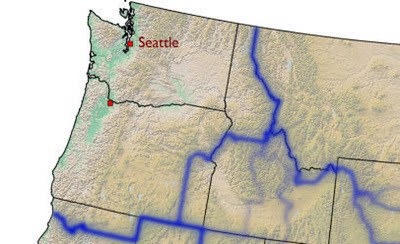 The idea is the create a country of Cascadia by calving off the northwest section of the United States and a connecting portion of western Canada. Like I said, this is an extreme idea. But, in a series of posts (with maybe no end), I'm going to point out that Cascadia already exists. And, that its different from the squishy regionalism around the idea of the "Pacific Northwest." This is the same sort of difference that my mind makes when I compare my own concepts of "the South" and Dixie. For me, while the South certainly has its own regional connotations politically and culturally, the differences become much sharper when you refer to Dixie. It is likely the racist, seceded from the Union and burning crosses stuff, but it's there. So, in these posts, the Northwest will become Cascadia. I'll discuss what makes Cascadia special. What makes it different from Ohio and Virginia and why those differences should matter to you. It seems to me when we talk about the Northwest (Cascaida) we talk about mountains, rain, salmon and coffee. But, we imply these are small, seemingly insignificant differences from the rest of North America. What I want to talk about is that we're a fundamentally different, the same way Ludlow, Massachusetts is different than Greenwood, South Carolina.